We admit it. We walked right by this scene the other day. No noticed but we walked right by. The Last Laugh. Captured at f11, 1/80 second and ISO 1600 at a 48mm equivalent focal length. Edited in Adobe Camera Raw. Then we stopped. We turned. We returned to the spot and took the shot. Furtively. Like we were stealing someone's soul. Can photographers steal souls, Gabriel? Of course not. But that doesn't mean we can't have the last laugh. And this was one of them. The glass doors you see once led to an exclusive men's shop. Which, like a lot of retail stores, has closed. Now those doors merely reflect the activity passing in front of them on the street. But what stopped us was the discarded clothing half in shade. 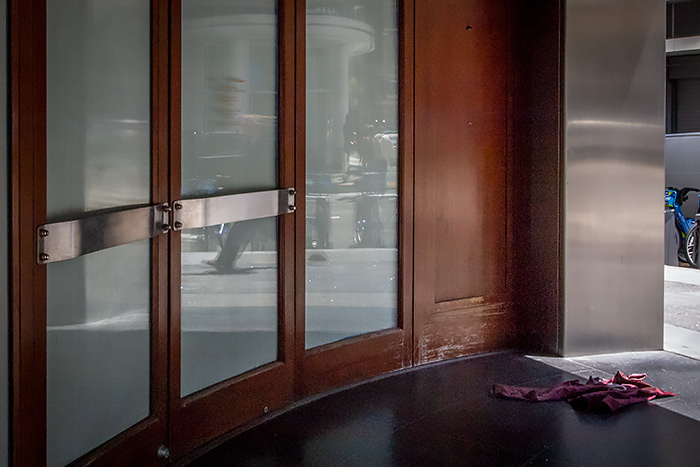 Someone, perhaps, had spent the night here, downtown deserted and left in peace. When they moved on, they didn't notice they had dropped this scarlet sweater. Or, who knows, it was in someone's luggage in a car that had been vandalized. But it ended up here, in front of the doors to a vacant store. No winners in this image. The exclusive store out of business, the person who lost a sweater. And the country we are becoming.